Legacy 2030 | Winston-Salem/Forsyth County Planning Board: What's Vancouver doing? The City of Vancouver started the EcoDensity Initiative to further develop the idea of “Laneway Housing” (back alley homes) to increase the density in existing neighborhoods while retaining the single-family feel of the neighborhood. Laneway Houses are detached dwelling units located in the back half of a traditional lot in the space that is normally reserved for a garage, facing an alleyway and maintaining the backyard open space that separates the main structure from the detached unit. These housing units have a maximum allowed square footage, are limited to 1 to 1.5 stories tall to avoid concerns about privacy, and can be either a traditional or contemporary design. Limited to residential rental or family use only, (they cannot be sold separately from the primary home), these detached housing units are intended to respond to the need for diverse kinds of rental housing in any community. Property owners can rent these units to help pay their mortgage, or provide a unit for a care-giver, a young-adult child or aging parents. The Monitoring Laneway Housing Implementation Report prepared in 2010, reviewed the context and designs of the first 100 units approved. The report stated that this type of housing is already making a noticeable mark on the city with houses distributed across Vancouver. One hundred Laneway Houses were developed in the same period as about 500 new single-family homes. 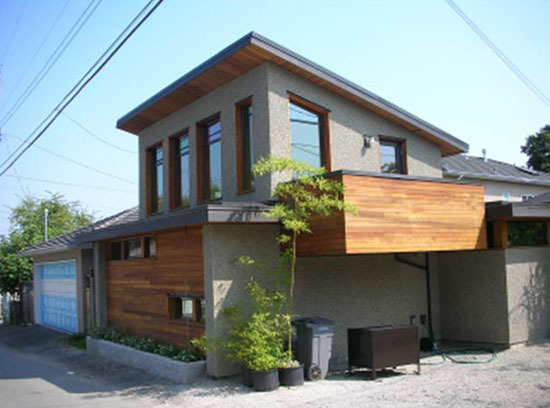 On average, 11 permits per month were issued city-wide and overall, for approximately every eight new single-family homes developed, one has included a new Laneway House.